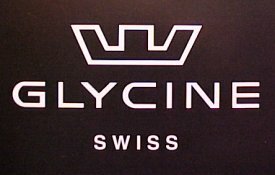 Last month, I contacted Glycine Watch SA to inquire whether they might consider providing TimeZone with a sample watch to be reviewed. 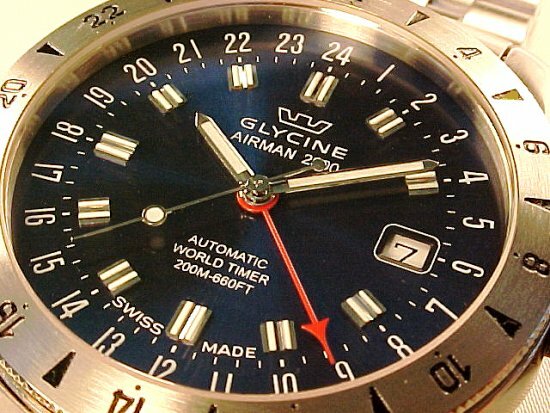 Glycine was kind enough to provide the watch that is the subject of this review, a Glycine Airman 2000, ref. 3764.18-1. 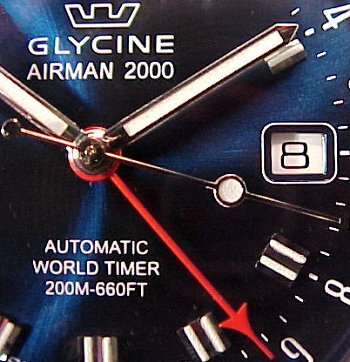 Glycine allowed TimeZone to award this watch to one person selected from among those who cast votes in the TimeZone/International Wristwatch Magazine “Watches of the Decade” and “Most Anticipated Watches of the Year 2000″ project. 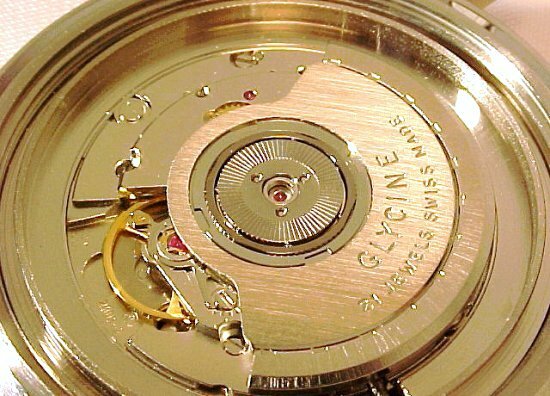 The Glycine watch company was founded in 1914 in Bienne, Switzerland. In 1934, Glycine introduced its first line of watches to pass the difficult tests of the Official Swiss Quality Control and earn chronometer certificates. 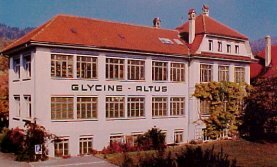 Glycine is one of the few companies to exhibit at the 1938 Basel Fair, and the company maintained production during World War II. In 1953, Glycine introduced the now famous Airman, featuring a 24 hour movement. Designed specifically for pilots, the Airman is considered by many to be a quintessential aviation watch. 1. The, Bezel, Crystal, Dial and Hands. The Glycine Airman has a bi-directional rotating bezel engraved with 24 hour markings which are finished in black for easy reading. The bezel itself is stainless steel with a coin edge for better grip and an anti-reflective brushed finish. When turning the bezel, it offers a nice amount of resistance and a feeling of precision. The bezel and rotation mechanism feel well made. The crystal is sapphire. It is flat, beveled at the edge and set slightly above the bezel, which should help prevent scratches on the bezel. The crystal does not appear to have an anti-reflective coating, yet I find the watch easily readable. This Airman’s strongest visual attraction is be beautiful deep blue dial. The dial appears almost black in low light, but in bright or direct light, it almost glows in a brilliant blue. The dial has an inner ring of highly reflective, faceted and polished steel hour markers. 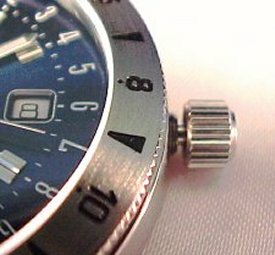 The 24 hour indications appear at the outside edge of the dial. The date appears at 3, in a contrasting black number on white background for easy reading. The date has a quick correction mechanism. This Airman has four hands. The hour and minute hands are wide and light in color, and they are quite visible against the dark blue dial. These hands provide the local time with a standard 12 hour display. These hands are coated and they glow brightly for easy reading in low light. The seconds hand is a “bubble” type, with a spot of phosphorescent material on the bubble. The fourth hand is bright red, and it provides the time in a second time zone. This hand moves in a 24 hour rotation, so you’ll always know if it is day or night in the second time zone. The second time zone hand also has a quick correction mechanism. All hand and date setting is accomplished with the crown. After unscrewing the crown, the initial position is for winding. Given a slight pull, the crown clicks into the first setting position, where you turn counter-clockwise to change the date and clockwise to adjust the red second time zone hand. Pulling the crown again allows you to set the hour and minute hands to local time. In this crown position, the seconds “hack” or stop. The seconds do not hack in the intermediate date/second time zone setting position. 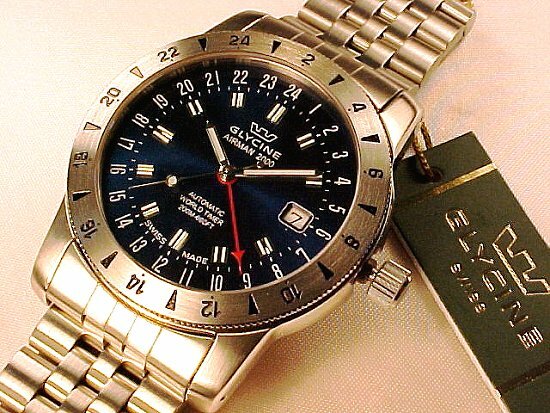 A third time zone can be tracked using the rotating bezel. Turn the bezel until the desired time marking on the bezel is opposite the 24 hour hand. Overall, this Airman provides a convenient, legible and attractive multi-time zone display. This Airman has a stainless steel case and bracelet. The case is brushed on the top with highly polished sides and back. 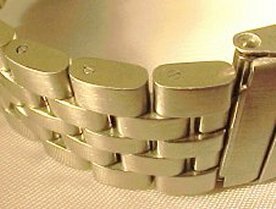 The bracelet is fully brushed front and back. The case is well finished with no sharp edges. The polishing is well done, even between the lugs. The watch is 40 mm in diameter not including the crown, and 10 mm thick. This watch requires a 22 mm strap. The lugs curve down slightly to give the watch a nice fit on the wrist. This watch has a screw down back and crown, and it is rated at 200 meters/660 feet. 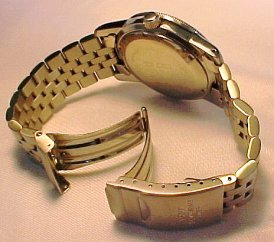 The bracelet attaches to the case by means of spring bars, and hollow metal attachments provide the transition from case to bracelet. The spring bars can be accessed from the back. The bracelet links are nicely finished on the sides, and there are a total of 6 links (three on each end) held in place with removable push-pins for sizing. 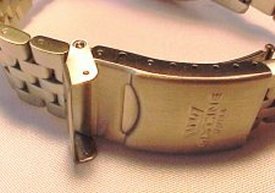 The bracelet incorporates a folding flip-lock buckle of standard design. The buckle cover adds additional sizing adjustments, and it is stamped “Glycine Swiss” with the company’s crown logo. The bracelet is well made and comfortable. The flip-lock functions well, and indeed it requires a bit of force to open, likely because this is a new watch. At least you won’t have to worry about this watch falling off your wrist. At the outset I should note that the movement photos below are of a different Glycine Airman from that pictured above. The watch pictured below contains the same movement as the watch being reviewed. 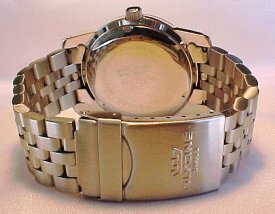 We did not open the watch pictured above because we are awarding that watch in a drawing, and we wanted to insure the winner received the watch unopened and intact. 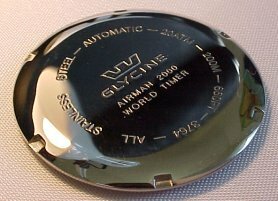 The Glycine Airman uses the ETA 2893 movement. 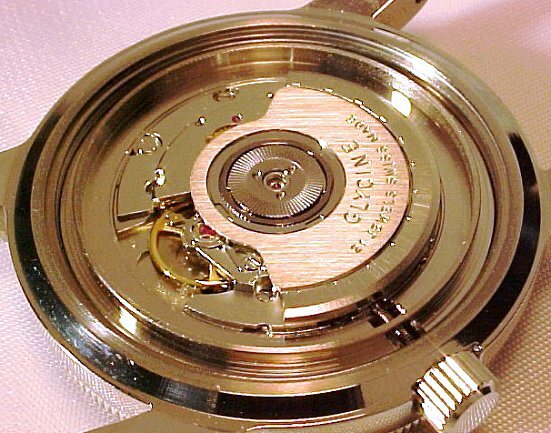 This movement is automatic winding with 21 jewels and 28,800 vph. 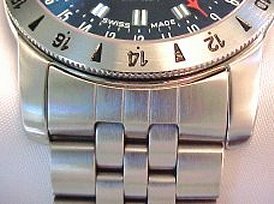 The movement is essentially undecorated, except for the brushed finish and engraving on the rotor. The plates and bridges are polished, as are the screw heads and exposed steel components. The balance wheel has three spokes and incorporates Incabloc shock protection. This is a basic-dress ETA movement with a good reputation which should give many years of reliable service. This Airman is an accurate timekeeper. I compared it with my atomic clock for the first 48 hours out of the box, and it ran at + 5 seconds per day, being stored dial up at night. Better performance might be achieved experimenting with storage positions when the watch is not in use. 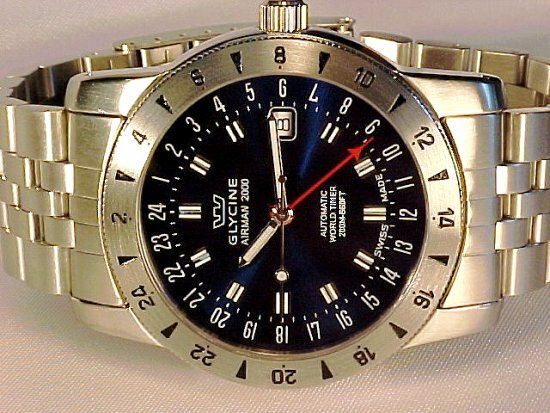 This Glycine Airman has a USA list price of $907. Another version is available with a mineral glass back. 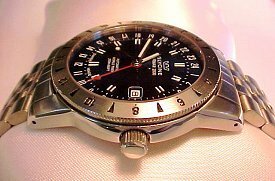 This watch offers good looks, a well finished case with sapphire crystal, a good bracelet, a three time zone display with a 24 hour hand and a strong reputation among pilots both military and civilian. At 40 mm, the watch has a strong presence on the wrist, yet it is not uncomfortably large or heavy. 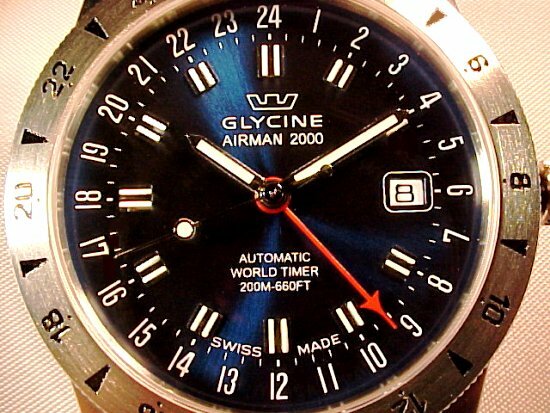 On the whole, I feel this Glycine Airman offers good value. 5. Summary and Contact Information. 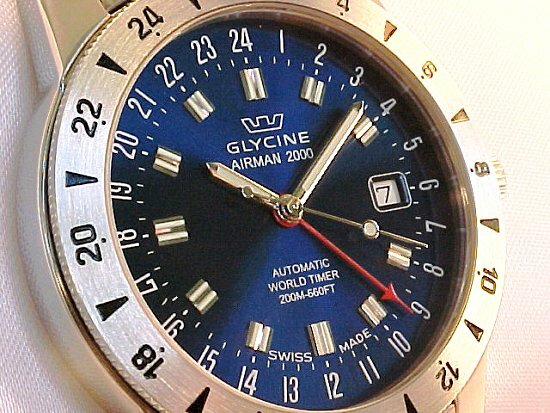 Watch reviewed: Glycine Airman 2000, ref. 3764.18-1. Stainless steel case and bracelet with screw down back and crown, bi-directional rotating bezel and sapphire crystal. Dark blue dial. Hour, minute and hacking second hand, second time zone 24 hour hand, quick correcting date at 3 and 24 hour hand. A third time zone can be read using the bezel. Movement: ETA 2893, 21 jewels, 28,800 alterations per hour. Water resistance rating: 20 ATM / 200 meters / 660 feet. Suggested USA retail price as of the date of this review: $907.